A modern valve distortion and harmonic enhancer classic makes the move to virtual - an essential buy for UAD-2 users hungry for top-notch harmonic enhancement. Useful on any and all sounds. Fantastic distortion model. Great presets. Excellent enhancer. Link and parallel modes. Faithful emulation. For 15 years, Thermionic Culture's valve distortion box has been a staple in high-end studios. Now it's available for your UAD system. 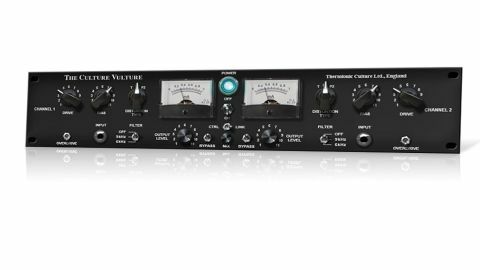 Thermionic Culture's Culture Vulture distortion unit has been recognised as a unique modern classic for over 15 years. At restrained settings, it brings stunning warmth, weight, character and roundness to everything from bass and drums to guitars, synths and vocals - there's simply no signal that can't be harmonically enriched with it. But as well as that, at extreme settings, it's one of the nastiest (in a good way) distortion devices ever made. Until now, the Culture Vulture has only been available in the shape of a very expensive rackmount box, but with the release of the plugin version (VST/AU/RTAS) for UAD-2 and Apollo systems, 'the rest of us' have a chance to get in on the action, too, albeit in emulated form. Culture Vulture is a remarkably simple device in terms of both design and usage. The main control is Type, which switches between three valve modes. T is triode valve emulation (painstakingly modelled on the hardware), perfect for applying a touch of warmth and softening. P1 is a pentode mode, boasting more harmonic content - in effect, 'enhancement' rather than distortion. P2, on the other hand, is the overt rip-the-arse-off-your- signal, full-on distortion mode. Fabulous. "There's absolutely nothing we don't like about UA's Culture Vulture"
The next key control is Bias, used to control the current running through the valves. Low settings can deliver some interesting results - the response is non-linear, and at low levels, the slightest variation in the signal can have a big influence on the sonic effect. At higher signal levels, however, the results are much more predictable - and very phat indeed. Prior to the Type and Bias controls, there are two controls for setting the input level into the valve section: the Drive knob, for pushing it as hard as is desired, and the Overdrive button for really slamming it. There's also a 12dB low-pass filter with three settings (Off, 4kHz and 7kHz) onboard for rounding off the sound. It's just the thing for reining in guitars, bass and other elements that might get cluttered up by too much high-frequency action. After this comes the Output dial, which controls the signal level going into a second, separate output valve. Were this a review of the hardware, that would be all the controls covered, but the plugin version also includes two new additions: a very useful wet/dry mix knob and a link switch for simultaneous adjustment of the left and right channels. The latter is particularly welcome, as one of the few criticisms of the real thing is how fiddly it can be to configure in stereo, partly owing to the right channel control placements being a mirror image of the left but more due to the high sensitivity of the controls. There's absolutely nothing we don't like about UA's Culture Vulture - apart from, perhaps, the mammoth dent it makes in the host UAD system's resources. When you hear what it does, though, that feels like a price well worth paying - this is very much an effect you will be happy to insert, set, print and move on from. It also works well as an auxiliary effect, adding richness and presence to everything sent to it. For any producer in any genre looking for a way to add unmistakable character, warmth and presence - or just pulverising distortion - to any of their sounds, Culture Vulture is the definitive plugin of its type.